Recording Career: Yes I Can! 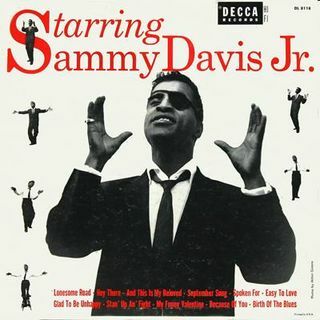 By 1948, Sammy Davis, Jr. was making a name for himself as the drawcard member of the Will Mastin Trio, an opening act appearing in clubs and theatres around the United States. 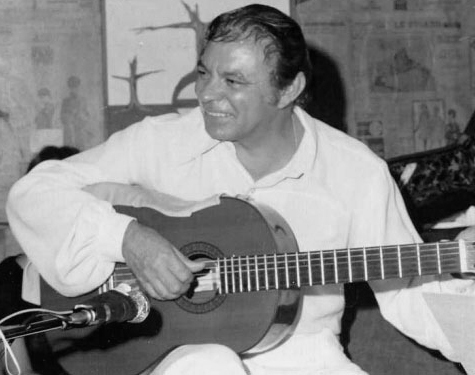 The Trio had become somewhat successful, opening for headliners such as Billie Holiday, Mickey Rooney and Frank Sinatra, but had yet to hit the big time. Sinatra had encouraged Sammy to sing in his own voice. 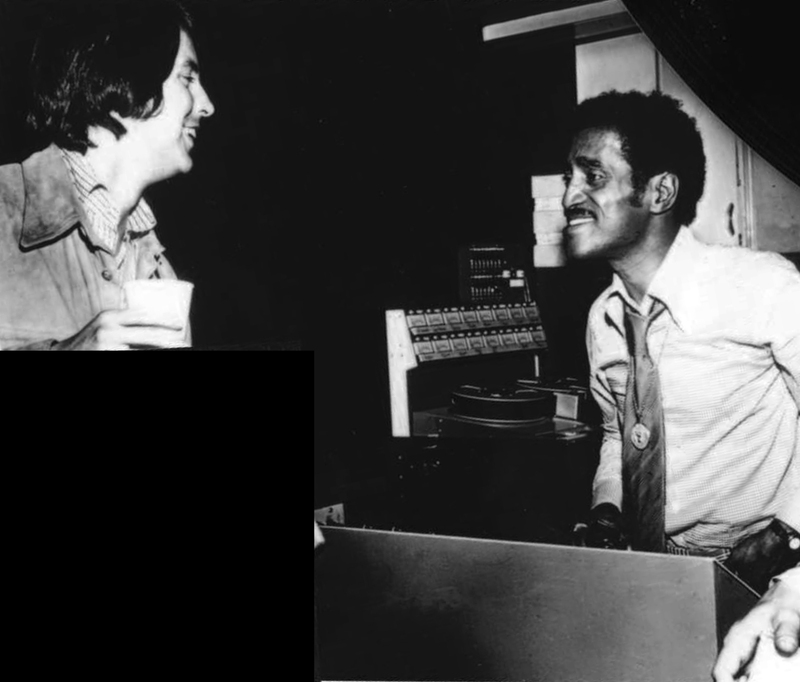 His first opportunity to do just that came after Capitol Records executive Dave Dexter heard Sammy on a radio broadcast from LA in late 1948. He asked a mutual friend, big-band drummer Jesse Price, to contact Sammy and he was soon signed to a 20-record deal – at $50 per side. Although the singles released were commercially unsuccessful (even resorting to releasing two singles under different pseudonyms – Charlie Green and Shorty Muggins), “The Way You Look Tonight” was chose by Metronome magazine as their ‘Record of the Year’ for 1949. The magazine also labeled Sammy the year’s ‘Most Outstanding New Personality’. Sammy actually had some trouble finding his ‘own’ voice, and many of the recordings feature him adopting (or overtly mimicking) the vocal styles of popular singers of the day. In retrospect, Sammy considered that the arrangements and direction of Dave Cavanaugh were somewhat lacking, but it is clear that further work was necessary for him to develop his own style. Following their release on Capitol, the recordings remained largely unissued until the 1990s. Four years after his experience with Capitol Records, Sammy had a much better command of his craft. While he was including more ‘straight’ songs into the Will Mastin Trio’s nightclub act, he was still primarily famous for his dancing and singing impressions. Hence, he was reluctant to sign another recording contract, fearing a repeat of his Capitol experience. 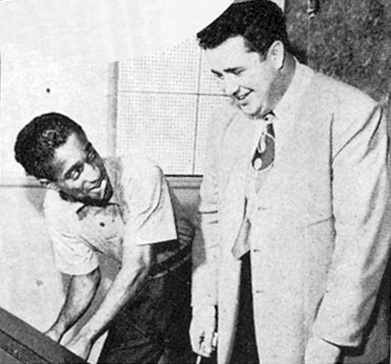 Decca’s Artists and Repertoire Executive Milt Gabler (Billy Crystal’s uncle) eventually convinced Davis to sign. He told him he could be a great singer in his own right, not just a great impressionist and dancer. 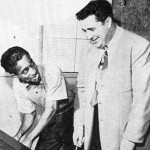 When Billboard announced Davis’s signing in June 1954, it said that instead of featuring impressions, “Decca plans to put his own style on record”. This time everything fell into place. His very first single, “Hey There”, was #1 on the Cash Box Record Charts for 8 weeks starting on 25 September, and remained on the charts for 23 weeks. A car accident the following month, in which Davis lost an eye, was not only a devastating physical blow but potentially a threat to his confidence and his career. Instead, Sammy’s legendary comeback at Ciro’s on 11 January 1955 saw him conquer any fears, and ride a wave of positive publicity. Decca quickly had another four sides recorded on 26 January, releasing the completed LP Starring Sammy Davis, Jr. on 18 April, with Sammy wearing his now-iconic eye patch on the front cover. By 11 June, it was the #1 album on the Billboard charts, and stayed there for 6 weeks. The period 1957-1960 contains the artistic peak of Sammy’s recording stint with Decca Records. This includes a swinging album in the style of Ray Charles with the backing of the Count Basie band (minus Count Basie himself for contractual reasons), a memorable guitar-only album with Mundell Lowe, sessions featuring musical showstoppers arranged and conducted by Buddy Bregman, and two duet albums with Carmen McRae. Very little of this quality material has seen wide reissue (outside of Japan, at least). As with Sammy’s 1954-1956 Decca output, there remains several unreleased recordings. Some of these still exist (they were on eBay at one point around 2005) but considering the difficulties suffered by the Davis Estate in recent decades it is unlikely they will see the light of day any time soon. The decision for Sammy to leave Decca Records at the end of 1960 was taken solely on the grounds that Frank Sinatra was leaving Capitol to create his own record label. Frank’s new label, Reprise Records, signed not only Sammy but similar artists such as Dean Martin, Bing Crosby, Rosemary Clooney, Count Basie, and Duke Ellington. 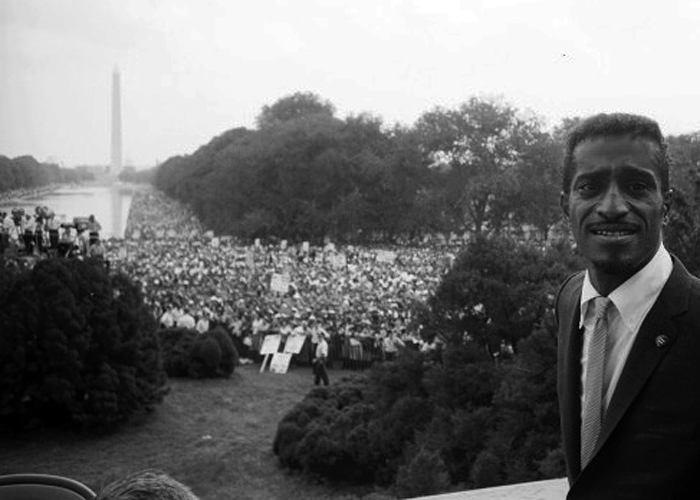 Sammy signed his contract on the 1 September, 1960. 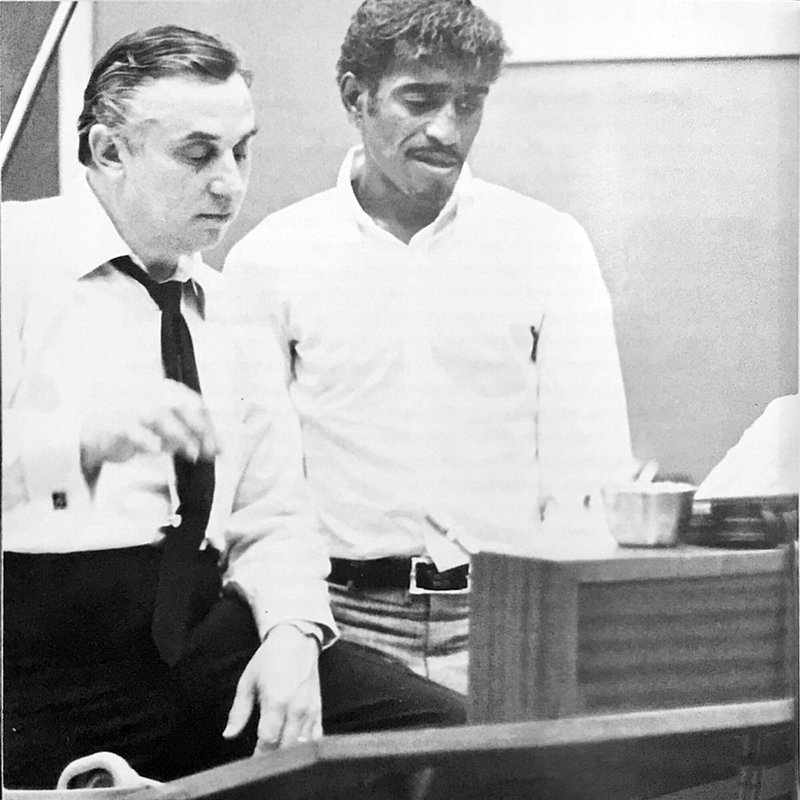 With Frank looking out for the artists’ rights, the standard Reprise contract allowed for the rights to recorded masters to revert back to the artist after a short window but Davis actually signed these rights away – in the search for more short-term cashflow. Subsequent contracts with Reprise were signed on 1 July, 1962 and 23 September, 1963. 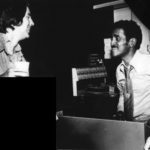 In his first few years at Reprise, Davis chose Marty Paich as a frequent collaborator, doubtless impressed by Paich’s work with Davis’ long-time friend Mel Tormé on Bethlehem and Verve. It was Paich’s ‘West Coast Jazz’-style approach that saw Sammy make some of the best recordings of his entire career during this time, most notably on one side of Sammy’s debut album on Reprise, The Wham Of Sam. Paich also arranged Sammy’s hit single “What Kind Of Fool Am I”, which was on the Billboard charts for 15 weeks in 1962, and was Grammy-nominated for Record of the Year. Other highlights of the period 1961-1964 include standout albums of Broadway showstoppers, a collaboration with Sam Butera and The Witnesses, a live album recorded at the Cocoanut Grove, an album of songs composed by Mel Tormé, finally an official album with Count Basie and His Orchestra, and the cast recording from his second Broadway musical, Golden Boy. 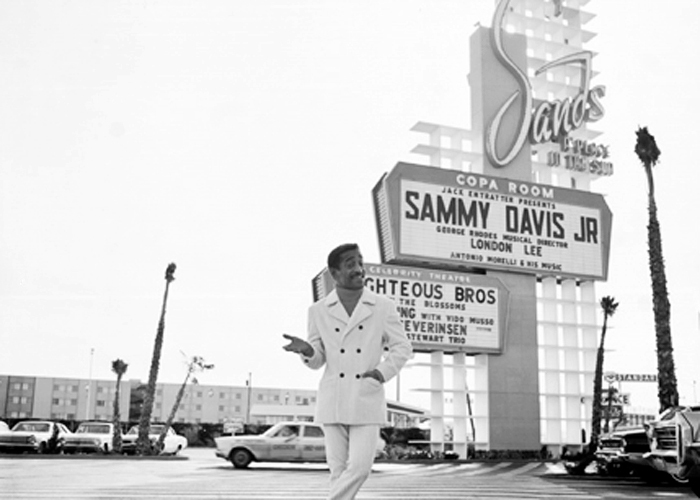 With the musical finished, Davis returned to the Sands Hotel in May 1966. What followed over the next two months were three major highlights of his recording career. The first was a live double LP released of Sammy’s Sands performances titled That’s All, which serves as a time capsule of Sammy’s mid-60s prowess. The second was another live album from the Sands, The Sounds of ’66. This was a recording of an early morning show put on specially for performers from other hotels on the Las Vegas strip, with Sammy accompanied by Buddy Rich on drums and his big band. Both Sammy and Buddy are in swinging form. However, this became less and less the case as the 60s wore on. He had another hit single in 1968 with “I Gotta Be Me”, which peaked at #11 and became a signature tune. But increasingly, Sammy’s Reprise recordings followed the downward trajectory of his career and his life at large. Caught up in the social upheaval of ‘Swinging London’, Sammy started to abuse booze and drugs, started wearing outrageous fashions, divorced his wife May Britt, and began unintentionally cultivating an image as an aging hipster. In the recording studio he attempted more R&B-styled material, with little success, and started lifting from the Blood, Sweat & Tears songbook. 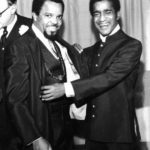 It was clear by 1970 that Sammy Davis, Jr.’s music was not selling well on Reprise, and that this was unlikely to change. His manager Sy Marsh decided a change was necessary. Berry Gordy, Jr.’s Motown seemed like a good fit. In the words of Marsh, “the world’s number one record producer, who’s black, has signed the world’s greatest entertainer, who’s also black”. Part of the deal signed in April 1970 was that a new label be created. It was called Ecology, and would be distributed under the Motown umbrella. 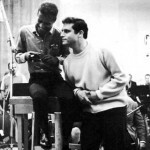 The first move made by Motown was to release the masters Sammy had taken with him from his last two Reprise sessions in October and November 1969. The material was largely covers of Blood, Sweat and Tears songs and other popular music of the day, and was titled Something For Everyone. The cover art was a case study in double entendre embarrassment, featuring Sammy in the midst of what looked like his own personal harem. The album was a commercial failure, which must have given Motown some pause. 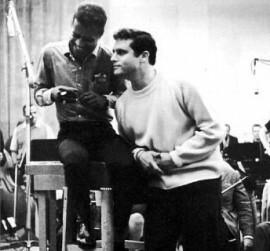 Sammy now laid down new tracks for Motown, although it appears that most were still being produced by his former Reprise producer, Jimmy Bowen. One single was released on the new Ecology label. Marvin Gaye showed an interest in producing new tracks with an eye to releasing a ‘real’ Motown LP. Motown engineers were also sent to record live concerts at Carnegie Hall in New York and the Now Grove in Los Angeles. What happened to all these recordings is a mystery. After neither the first LP nor the Ecology single sold well, Motown declined to issue another LP. According to Sammy’s 1989 memoir Why Me?, Gordy told Marsh they didn’t think Sammy had “the Motown sound”. Marsh indicated that this wasn’t exactly a surprise. 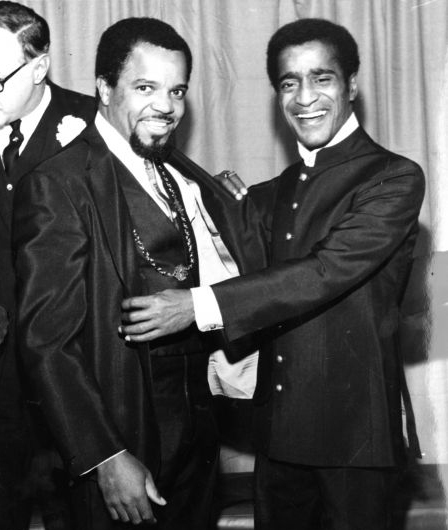 Using the threat of going public over Motown’s inability to make the Sammy situation work, he subsequently talked Gordy into severing the relationship and providing Sammy with all the unreleased material. And so the deal was reached which saw Sammy leave Motown quietly. Instead, the very reverse occurred. 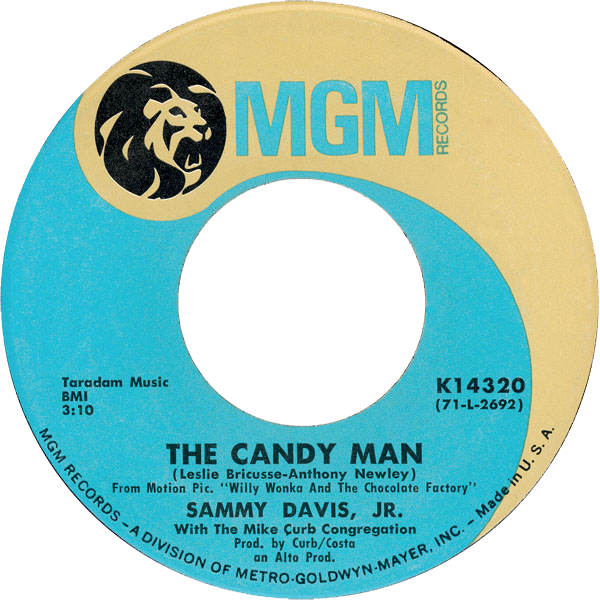 “The Candy Man” became the most successful single of Davis’ career. After debuting on the Billboard Charts on 11 March 1972, the single remained there for 21 weeks, peaking at #1 on 17 June (where it remained for three weeks). MGM then appears to have taken some of the content brought over from Motown, added additional content recorded for MGM, and released the album Now in April 1972. It charted at #11. Paired with a still-famous TV appearance on 19 February on All In The Family in which he kissed bigot Archie Bunker, “The Candy Man” briefly reinvigorated Sammy’s career. 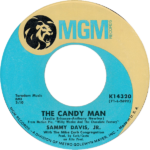 Despite this, subsequent albums on MGM through 1973 and 1974 were largely failures, coming as they did during a period in which Sammy’s career faced multiple problems, some of a political nature, following his endorsement of President Richard Nixon for re-election. 1973 was the start of five years of heavy drug and alcohol addiction. Sammy would find one more signature song, though, in the early 1970s – “Mr. Bojangles”. This was another song which Davis only very reluctantly began including in his act (perhaps fearing its autobiographical potential), and once it proved popular, he recorded it for MGM. 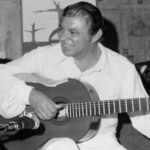 It soon became the closing number to his act and remained closely identified with him for the rest of his career. None of Sammy’s MGM LPs have been directly reissued on CD or for digital download and there also remains some unissued material. Many individual recordings have, however, made it onto compilation CDs. The exact arrangements of Sammy’s recording career from the mid-1970s onward are somewhat unclear. MGM was sold to PolyGram in 1972, and once they started to phase out the label, Mike Curb left to found Curb Records (which had a distribution deal with Warner Bros.) and formed the Warner-Curb label. Meanwhile, in 1976, PolyGram signed a distribution deal with 20th Century Records. Therefore, Sammy’s recording output from this point onward appears mostly on releases from Warner Bros., Curb Records and 20th Century. In the latter case, many releases were European only. It seems a constant was Mike Curb, who helped produce Sammy’s few recordings during this period, mostly versions of TV themes. Davis also released live recordings of concerts in Australia in 1977 and 1979. In 1978, Sammy’s life began to turn around significantly, in part due to intervention from Frank Sinatra who was concerned about his substance abuse. In addition, he became involved in a new project for which sobriety was required – the musical Stop the World – I Want To Get Off. The production began rehearsals in April, toured from May to July, and opened on Broadway in August 1978. The cast album would become Davis’ second last LP release. By 1982, Davis was back on top of his game and had become a respected headliner again, touring the world to his former acclaim. But his time as a recording artist had long since come and gone. His final full length LP, Closest Of Friends, a Country and Western album recorded in Nashville, was probably a labour of love for someone with a great affinity for all things Western (he had acted in several Westerns on film and television and in his hey-day he was said to be one of the two fastest draws in Hollywood). This final album did, however, provide easily licensable material for a million cut-price CD producers to use in their phony Davis ‘Greatest Hits’ or ‘Rat Pack’ collections. This was a final indignity to a recording career that, until recently, has been almost criminally under-reissued.